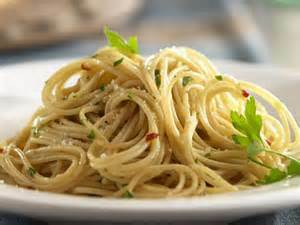 Recipes - Entrees - Spaghetti with Garlic and Oil - Salado Olive Oil Co. In a small skillet, cook garlic in olive oil till golden brown. Add parsley, salt and pepper. Cook for 3 minutes. Cook pasta in boiling water according to directions on package adding 1 teaspoon salt and 1 teaspoon olive oil. Drain and toss garlic mixture with pasta till completely coated. I always have a tossed salad as a side with Salado 25 Year Traditional Balsamic as the dressing. While getting everything together, I make a garlic bread with lots of garlic salt and use the Salado Olive Oil Butter Oil. Put in oven at 350 degrees for 5 minutes or until cheese melts. YUM!